I enjoy writing military hardware pieces, but usually the information is academic because the machines aren’t available to the public. Not so with the Christini AWD 450 Military Edition. 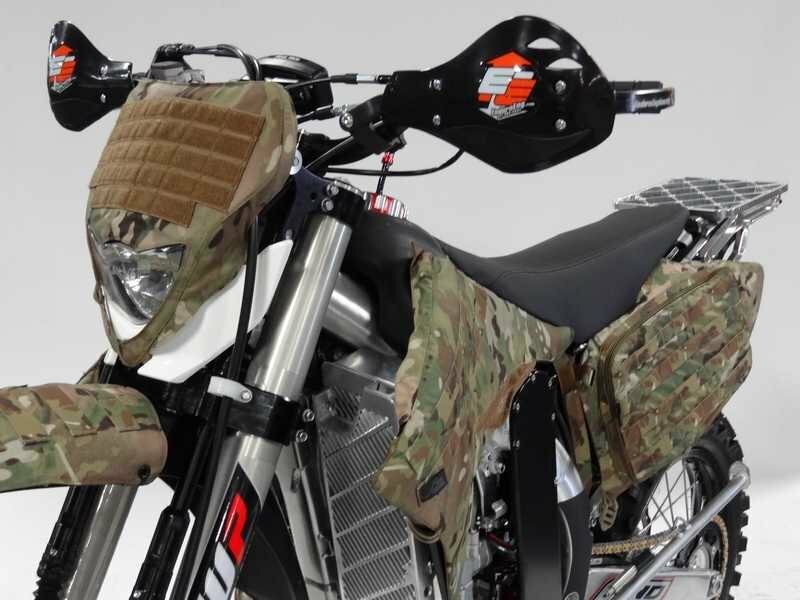 Even thought it was designed for military use, Christini decided to make it available to the general public, thus moving it from the realm of wishful thinking into that of possibility. Possible daydreams are my favorite. 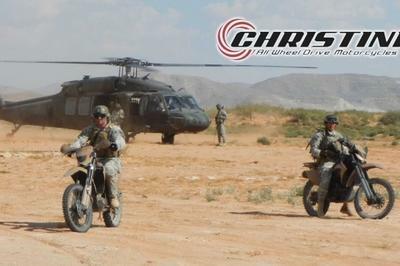 Christini partnered up with James King, founder of the Tactical Mobility Training program in Fayetteville, North Carolina, to produce a training regimen for U.S. troops who use the Christini AWD bike. The program was designed to train riders to operate deep within enemy territory, far away from roads or other infrastructure. 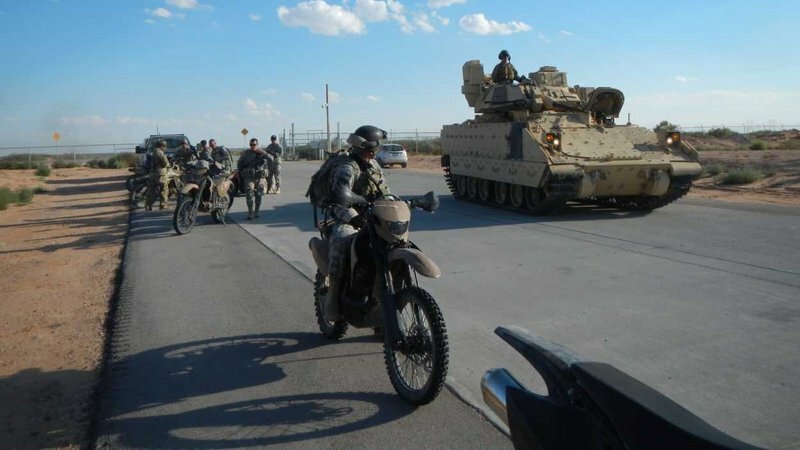 This ride isn’t just for military applications either – police, park rangers and first responders will find it a useful addition to their motor pools and it can also serve as a viable option to traditional ATV/UTV-type vehicles used in hunting pursuits. 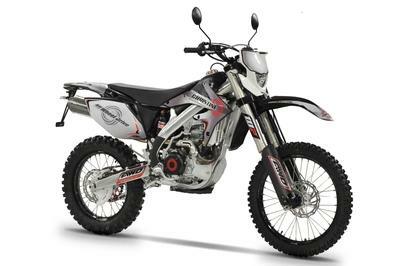 Continue reading for my review of the Christini AWD 450 Military Edition. 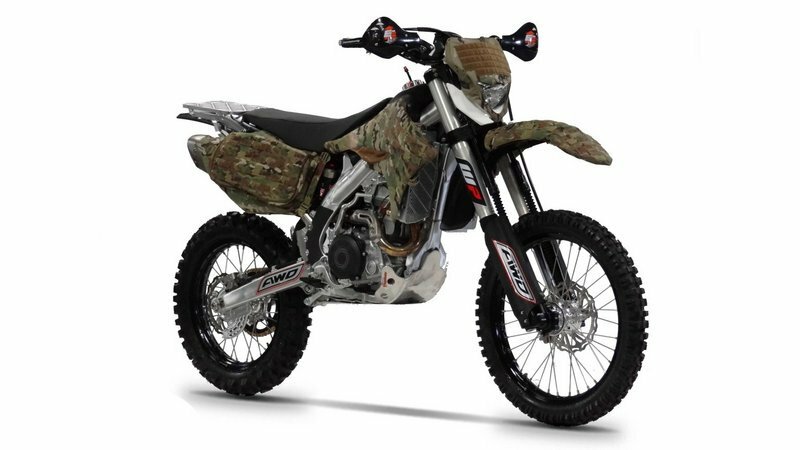 What we have here is a military-centric trim package on the same chassis as the Christini AWD 450 E, or you can opt for the 450 Dual-Sport (DS) as the base, both of which are set up to be fairly typical-looking dirt bikes. 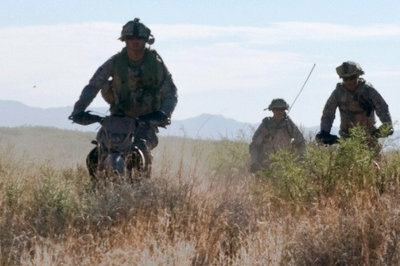 The upper lines are nearly straight, with only the slightest sway in the saddle, a feature that allows the rider to shift his weight fore and aft when negotiating rough terrain. Body-panel appointment is rather sparse, and after the muffler and front-wheel drive chain covers, there is only enough to encase the fuel tank. Nothing else is left to the imagination, which I’m sure was done so the operator can effect quick repairs in the field, and the panels and fenders have camouflage covers. The rolling chassis begins with a twin-spar aluminum frame, modified to mount the various shafts, gears and chains for the front-wheel drive. Big wheels roll over obstacles while small wheels run into them, so the factory used a 21-inch front wheel and 18-inch rear, to keep this ride going over the nastiest terrain – even when damaged. Optional foam tire inserts prevent the tires from going flat, and keep them in serviceable condition under fire. Not a lot of bike here, so not a lot of brakes needed. Both the front and rear wheels get a single, 240 mm Nissin brake disc to bind the wheels. No ABS or anything, just good-old-fashioned brakes. When you’re in country, simple is good. The front suspension components are almost overkill, with inverted, 48 mm WP forks. They come with adjustments for preload, high/low speed compression, damping and rebound, which allows you to dial in the precise handling characteristics you need. 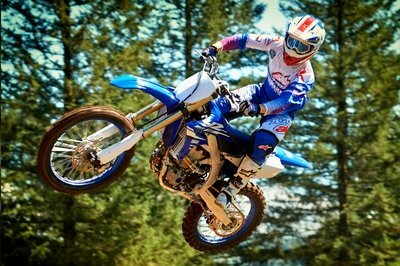 A single, ELKA Stage 5 shock manages the swingarm. Finally, ladies and germs, we get to the onion – the ingenious Christini “All-Wheel Drive” system. Why not call it “front-wheel drive” or “two-wheel drive,” you ask? The differences are subtle, but important all the same. With the Christini system, the front wheel drive power take-off (PTO) sprocket is a wee bit smaller than the rear wheel sprocket, which makes the front wheel turn at about 80 percent of the rear wheel speed. An overrun clutch allows the front hoop to freewheel as long as the rear wheel has traction, and it behaves like any other bike. 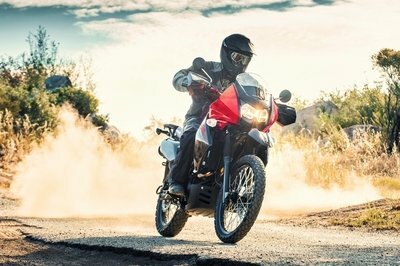 When the rear wheel loses traction, the front-wheel power kicks in to pull the bike forward until the rear regains purchase. This way, you get a ride with predictable handling, but with a little extra boost when you need it. Power comes from the liquid-cooled, 450 cc, one-lung engine. Induction control comes in two options – go for the Christini EFI for efficient air-fuel control, or the low-tech but easy to repair 40 mm Keihin FCR carburetor. The bike comes with an electric starter and a kick-starter, providing a little redundant backup for this most-important system. 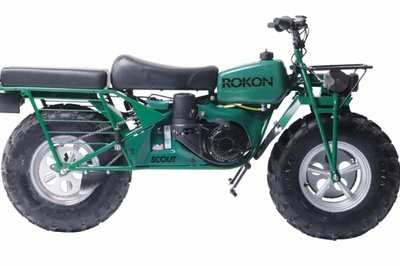 While two-wheel-drive bikes come and go as different manufacturers experiment with the technology, one steadfast competitor is always in the background – Rokon. 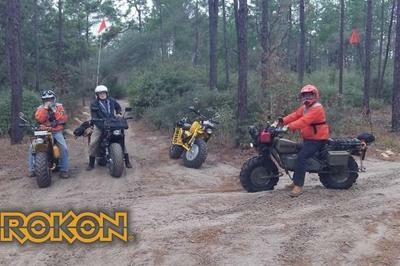 Even though the Rokon Trail-Breaker and the Christini follow radically different designs, both offer power at the front wheel to tackle extreme terrain, and both have seen military service. Christini is keeping the engine-performance numbers on the 450 close to the vest, but I think it’s a safe bet to just go ahead and say “more than the 7-horsepower Kohler on the Rokon.” The Rokon allows you to carry five extra gallons of fuel (or water) in each of its hollow wheels, quite a bit more than the 1.5 auxiliary tank offered by Christini. Not a deal breaker, but still a factor. I gotta say that the Christini seems like a whole lot more bike for the money. At $9,995, it’s a bit over the Rokon at $7,350, but the Christini is more of a proper bike, while the Rokon seems little more than a minibike with an attitude. I’m not sayin’ that’s a bad thing. I’m just sayin’ that it is. My wife and fellow motorcycle writer, Allyn Hinton, says, "I really like the AWD system in these Christini bikes. It’s a more natural feel than a 2WD system. As a mechanic, I also like the easy accessibility to service information on the Christini site. Rokon is like that, too." 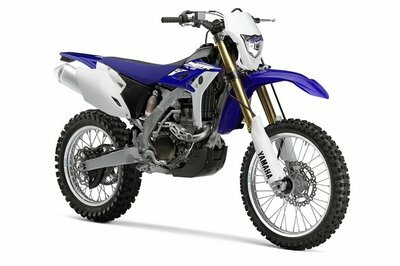 The AWD 450 Military model is built to order, so specs and price may vary.